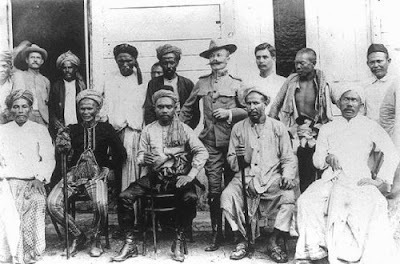 Mindanao Sultan Jamal ul-Kiram (seated at center), with his counselors. Mr. Jose Bulang and I have had several conversations about his ancestors. He lives in the Philippines, but his ancestors came there from the west, possibly through China. Bulang clans are found in many parts of the world. Some are the original inhabitants of Yunnan in China. Yunnan can also be Yon or Y-On (as in Biblical On on the Nile) or Y-Ainu. There the Bulang live in huts, often on pillars, in the humid mountain forests. A rite of passage to signal readiness for marriage among the Chinese Bulang involves dying their teeth. Here is another fascinating story told by Mr. Bulang. That said ancestor, according to my cousin Fausto Bulang when I started interviewing and building the house of Bulang as a genealogy, claimed that his family owned Panglao Island. This is highly impossible according to my cousin, but maybe true if that ancestor descended from Shri Vijaya empire which is believe to be ruled by a Suryavanshi, which empire used to have what is now called the Visayas group of Island of the Philippines as part of its territory. My friend Historian, wrote that Bool Kingdom of what is now Bohol was already recognized by Mecca, Saudi Arabia as a kind of Bishopric with Shariff Para as the Muslim missionary circa 1550 AD. He had written about ESKAYA, Ophir in relation to Bohol. His topic about Eskaya and Ophir can be read when Googled. There are many things coming back to my memory as I read about your blog relative to what my fathers in the past have told me and I experience myself. Thank you, Madame Linsley. I am not claiming anything, I just wish to be enlightened of some questions lingering in my mind about the origin of my family.